When it comes to door hardware, there are a variety of great products that you can offer to your customers. Doors in heated or cooled high traffic areas are frequently left open, meaning that a lot of money can be wasted on electricity. By simply fitting a quality door closer, the door will close smoothly after each person has walked through, keeping the temperature in that area constant. 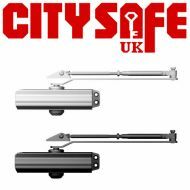 Here at CitySafe, we have the UAP Size 3 Fire Resistant Door Closer which has been developed to prevent fire from spreading for up to 60 minutes!